On Saturday the 8th of December, Sligo will host a one day seminar in the MCR Community Hall on Mail Coach Road. The course will also offer students the ability to grade with gradings session on the day. 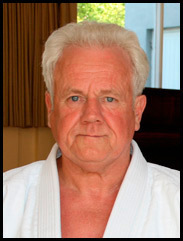 The course will be taken by Joe McHugh 4th Dan Aikikai, Eamon Coyne 4th Dan Aikikai and Trevor Pigott 4th Dan Aikikai. 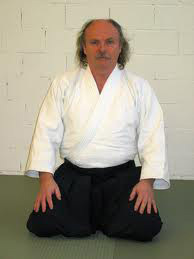 Joseph Kennedy of Budo Kilkenny will host an Aikido Course with Joe McHugh 4th Dan Aikikai in Inistioge, Co. Kilkenny on the 17th and 18th of November 2012. Full Course 50 Ruro. Concessions available. Aikikai Rathimines (http://aikidorathmines.com) and will host their Winter course with Matthew Holland Shihan, 7th Dan Of the Scottish Aikido Federation on Saturday 3rd and Sunday 4th November 2012. As space is limited, please inform us if you plan to attend. Email: aikikairathmines@gmail.com or telephone 089-461-8885. 20 euros for the course. 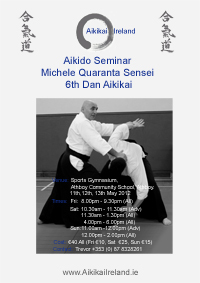 Aikikai Ireland will have the pleasure once again of hosting technical adviser Michele Quaranta on the 26th, 27th and 28th of October 2012 in Wicklow. Dan gradings will be held on the Saturday. 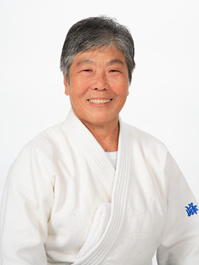 We hope to see you all at the course with Michele Sensei. The course offers the chance for students to enjoy the warm atmosphere at Michele Sensei's courses and also get exposure to the vast knowledge of Michele Sensei. Hello, Fiona,How have you been? It has been so long since we met in your country. to come and see you again. I am sad about it.I am sending my warm invitation to you all for my 40th anniversary International seminar on Guam.I hope some of you will be able to come and join us.I am also sending you my itinerary of my European tour in April and May.Please come and join us at any of the places I will be visiting. Looking forward to hearing from you soon again. 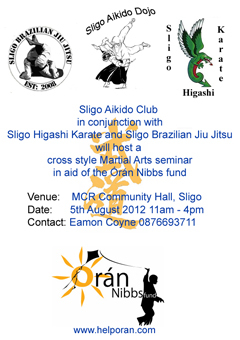 On Sunday the 5th of August, Sligo Aikido Club, Sligo Higashi Karate and Sligo Brazilian Jiu Jitsu will host a cross training martial arts seminar in aid of 3 year old boy Órán Nibbs who suffers from Mitochondrial Disease. All money contributed on the day by particpating students will go towards the Órán Nibbs fund. Anyone who has an interest in watching can do so no problem, you can also help by donating on the day too. What we aim to do here is to raise money for his continued care and medical needs, we know there is no cure for Mito but maybe Órán's life can be made just a little bit better.Any help greatly appreciated.Look forward to seeing and training with you on the day...Eamon. 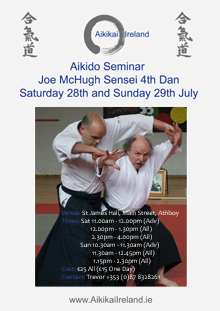 On Saturday the 28th and Sunday the 29th of July, Athboy Aikido Club will play host to another Aikikai Ireland seminar with Wicklow Dojo instructor Joe McHugh 4th Dan Aikikai. The course will offer the chance for students to get together and train in a very enjoyable atmosphere with Joe. St.James Hall, Main Street,, Athboy Co. Meath (see map below). 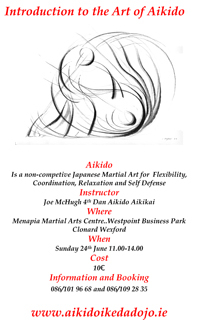 Ikeda Dojo Wicklow instructor Joe McHugh has been invited to give an introductory course to Aikido down in Wicklow. The course will occur on Sunday the 24th of June from 11.00am to 14.00pm. The venue for the course will be Menapia Martial Arts Centre, Westpoint Business Park Clonard, Wexford. The cost of the course will be €10 and all are welcome to come attend. 086/101 96 68 and 086/109 28 35. Click on the link below or on the pic to download poster. On Saturday the 23rd of June, Sligo will host a one day seminar in the MCR Community Hall on Mail Coach Road. 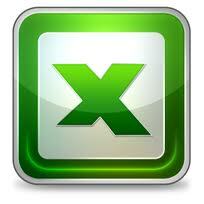 The course will also offer students the ability to grade with gradings session to be held afterwards. The course will be taken by Joe McHugh 4th Dan Aikikai, Eamon Coyne 3rd Dan Aikikai and Trevor Pigott 3rd Dan Aikikai. 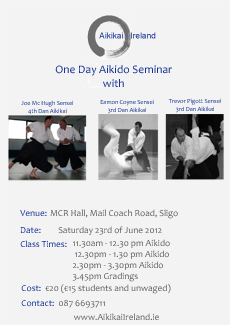 The course will run as follows first Aikido class 11.30am to 12.30pm, second Aikido class 12.30pm to 1.30pm. Lunch is 1.30pm to 2.30pm. Last class is 2.30pm to 3.30pm. The gradings will start at 3.45pm onwards.The course is extremely good value costing only €20 for the day (€15 students and unwaged). The Training Rooms, 11 O’Loughlin Road. 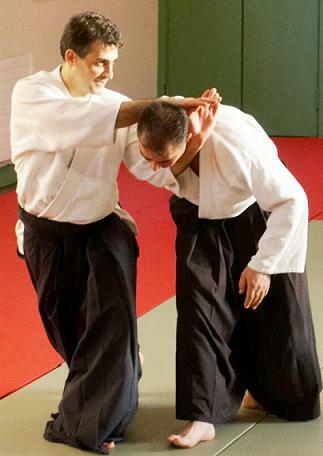 A weapons course with Fiordineve Cozzi Sensei 5th Dan Aikikai organised by Heron Dojo Fiona Kelty Sensei will take place on Saturday 9th and Sunday 10th of June in Dublin. The location is the ground floor hall beneath Heron Dojo at the Clogher Road Sport & Community Centre Crumlin, Dublin 12. At the course students can enjoy practicing the Jo and Bokken with Cozzi Sensei. €30 concession price for unwaged and for overseas visitors. Michele Quaranta Sensei Friday 11th, Saturday 12th, Sunday 13th of May 2012. 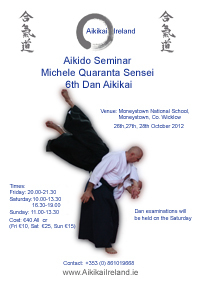 May 2012 Aikikai Ireland will have the pleasure of Michele Quaranta Sensei conducting a seminar. This is the second of three seminars this year that Quaranta Sensei will give in Ireland. The course will be held in the Athboy in the Sports Gymnasium, Athboy Community School, Kildalkey Road. The weekend offers a chance for everyone to meet and train with new and old friends and socialise and have the craic too, everyone at Aikikai Ireland looks forward to training with Michele again!!! 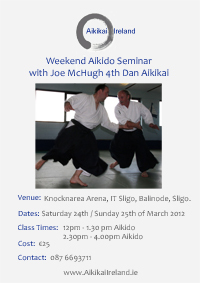 The IT Sligo Dojo will play host to the upcoming weekend Aikido course with Joe McHugh Sensei 4th Dan Aikikai. 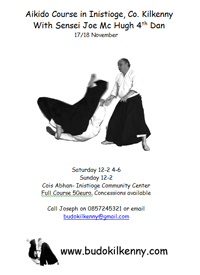 The course will give students the opportunity to train with Joe and have a great weekend training with students from all of the Aikikai Ireland dojos.The details are as follows. 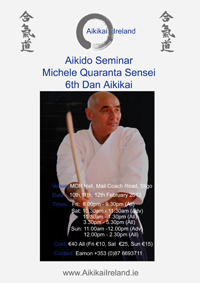 February 2012 Aikikai Ireland will have the pleasure of Michele Quaranta Sensei conducting a seminar. This is the first of 3 times this year that Quaranta Sensei will give a course in Ireland. 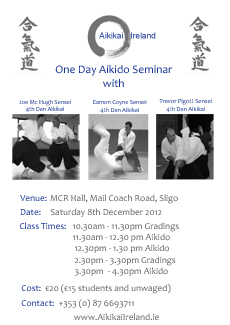 The course will be held in the Sligo Dojo, MCR Community Centre, Mail Coach Road, Sligo.